The first month of 2018 is in the books, so it's time to take a quick look at my first favorites of the year! 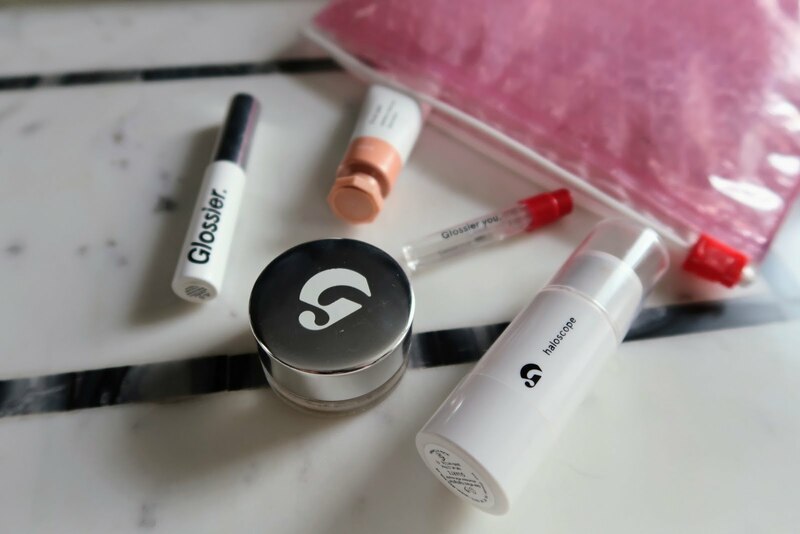 I've been using Glossier products since the middle of last year (thanks sister for the birthday present!) and I loved everything I had tried enough to ask for even more for Christmas. 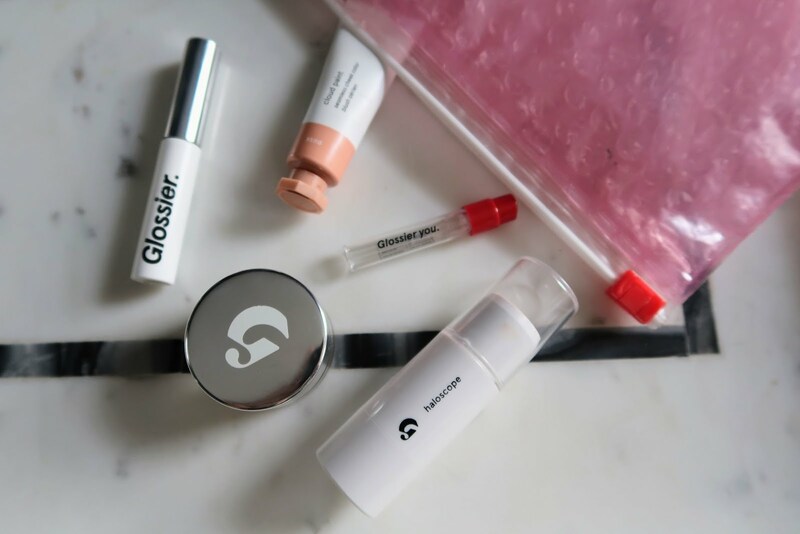 Thanks to my sister AGAIN (love yaaa) I now have tried the Cloud Paint (in Dusk), Haloscope (in Quartz), Balm Dot Com (Birthday Cake scent) and a small sample of their perfume, Glossier You. Just like the products I've tried before I have absolutely loved all of these. The Cloud Paint blush is so natural and blendable, and the consistency gives a much glowier look than a powder blush would, especially in the winter when my skin tends to be much drier. Initially I was a little disappointed at how small the tube was, but you seriously need only the tiniest drop which means the tube will last practically forever. I just take a small drop on my index finger, rub it together with my other index finger and then apply. I use a clean finger to blend it out. It's practically fool-proof which is exactly what I need at 6am. Haloscope highlighter is another creamy, super winter-friendly product. I was previously using the Becca Shimmering Skin Perfector in Moonstone and while I do like it for summer, a powder in winter just gives me icky feelings. Haloscope however is a really nice, pretty natural highlight and blends a lot better into my skin. I tend to alternate between rubbing some on my fingers to apply that way and applying it directly from the tube (aka when I'm extra lazy). I don't wear a lot of heavy foundation so I don't have much problem with it pulling my makeup when applied directly, but I can't really comment on how it'd perform for those who do wear more foundation. Overall, I really love the highlight it gives! The Balm Dot Calm in birthday cake is practically edible. I've been compulsively applying it, especially when I'm stuck at my desk all day. The glitter in the balm is not at all overwhelming -- it's more of a barely there type situation. Half the time I end up with more glitter on myself due to the packaging rubbing off on my hands when I grab it. I'm not even sure if any of the glitter on the tube will be left by the end of this week. If they could fix that, I'd be completely sold. It's a simple balm, and I'm sure it's nothing any better than regular old chapstick, but it definitely wins in the cuteness department and sometimes that's all I want for a little daily pick-me-up. I would also like to go on record and say that the Glossier You perfume sample that was sent with my package is the one and only perfume sample that I've completely finished. At first the scent to me smelled mainly flowery, but the more I smelled it it uncovered a depth and complexity that I didn't expect. It doesn't scream any one thing. There's lightness, but there's also warmth. It's girly but also hints at musky. It doesn't hit you with a big cloud of fragrance but makes you want to lean in to understand it all. I really enjoyed wearing this and it was subtle enough that I even sprayed some on my pillow case one night. I haven't decided if I want to make a full-sized purchase yet, but that's mainly because I already have too many perfumes I'm trying to work though. All in all I would definitely recommend this perfume to those of you out there that want a slightly more sophisticated floral scent. Don't forget you can get 10% off your purchase if you use this link! 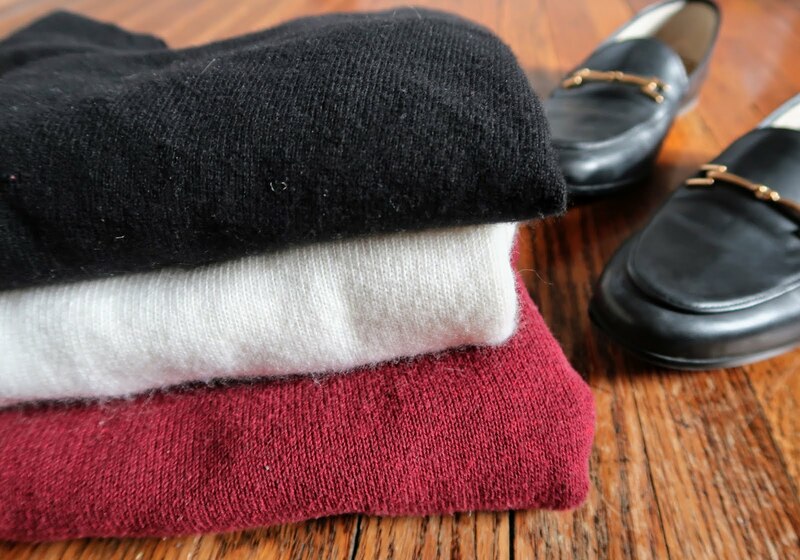 I would be completely remiss if I did not mention my January all-star, the MVP of my wardrobe, the probably over-worn black Everlane cashmere crew neck sweater. This thing is amazing. 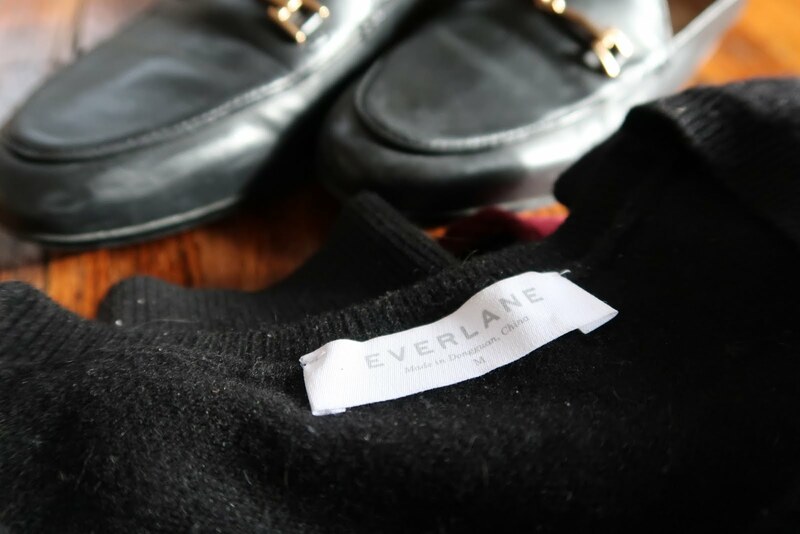 I've been working on adultifying my wardrobe lately, and for over a year I would frequently stare longingly at the Everlane link for their cashmere sweaters and think to myself "someday you'll be mine." Well, I finally did it. I purchased my first grown-up adult cashmere sweater in early fall and then sat and waited for the temperatures to drop. 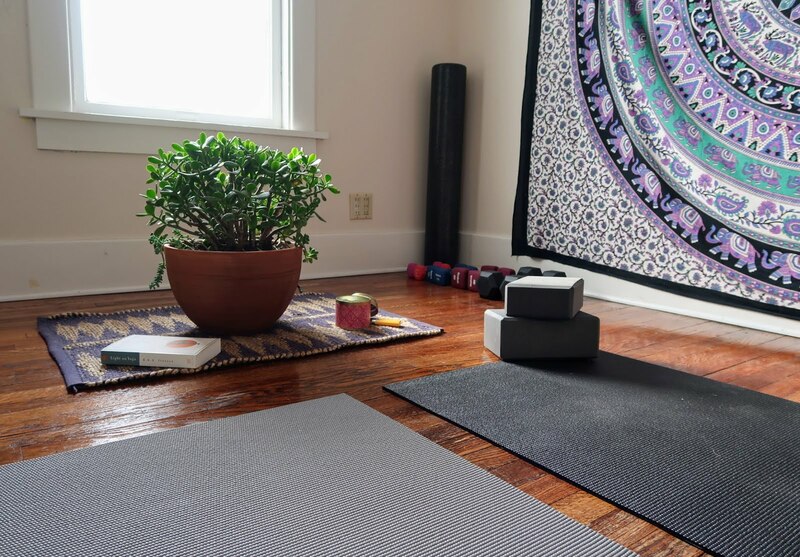 On the gym front, I've been taking a break from my gym this month and hitting my yoga mat at home instead. Every day I've joining in on the True 30 day yoga journey with Adriene over at Yoga With Adriene. I've done her 30 day yoga videos in past years, but something about this year's series is really clicking with me. I feel much more attune to all the nuances of the yoga, my body and the mindset. Taking a break from constantly focusing on the results and going along for the experience alone has been incredibly enjoyable for me. As the program comes to an end I'm already thinking about repeating the videos as a regular part of my workout -- and mental health! -- routine. Is there really anymore more important than food? All those other categories in life are great fun and all, but food -- it really has my heart. I'm finally getting back to eating better after a solid month or so of holiday meals and constant sugar. More veggies, less sweets (😢). 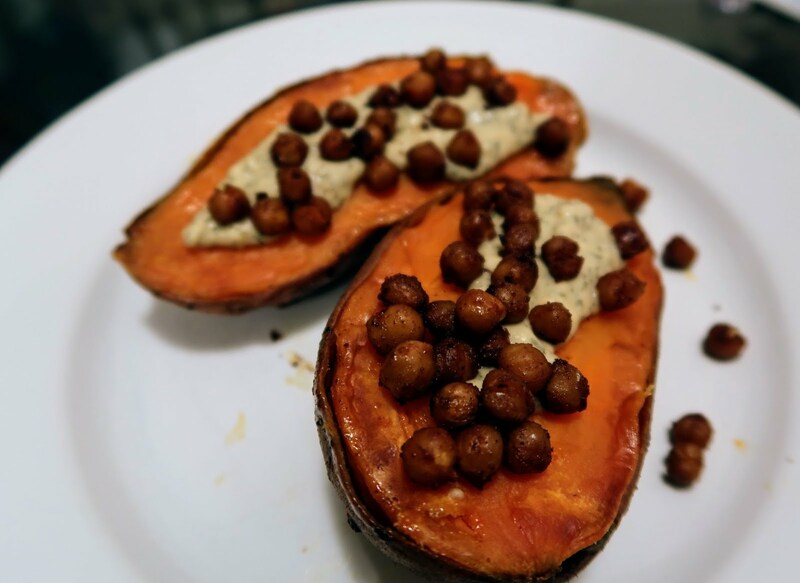 It's been hard to say goodbye to molasses cookies and pie, and to help me wean myself off, I decided to make cooking more of an adventure this month. I decided to cook all new-to-me meals for the whole month of January! I'll be letting you all know how that goes in an upcoming post so keep an eye out for that. The star of this adventure, however, has been the Minimalist Baker blog. I had never tried any of their recipes before this month, and so far every single one I've cooked has been amazing. They are all really simple, and while that made me worried that they wouldn't be very flavorful, I've been proved dead wrong. Somehow they manage to pack a flavor punch all while being really simple, using pretty common ingredients and keeping things healthy. I think I've accidentally eaten more vegetarian and even vegan meals this month than I have in my whole life and I definitely haven't missed anything. I am sure I'll be trying out a lot more recipes soon! That's it for my January favorites! See you guys next week!